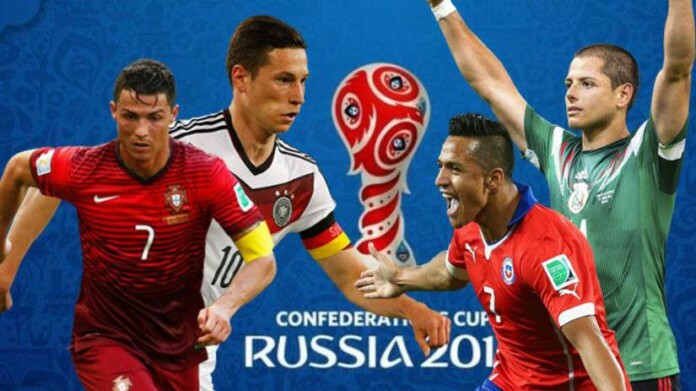 Today we have the first semi-final of the FIFA Confederations cup and it is Portugal playing against Chile. The game will be played at the Kazan Arena in Kazan. Portugal were the table toppers in group A with seven points from three games. On the other hand Chile finished second on the table in group B with five points from three games. Portugal have been very clinical in the Confederations Cup till now with two wins and a draw. They have the best player in the world right now, Cristiano Ronaldo who has won three man of the matches in three games he has played in the confederations Cup. He will be very important on the pitch and will be leading from the front as he has done in all the matches he has played till now in the tournament. They played against New Zealand in their previous game in the Confederations Cup and won the game by 4-0 with ease. Ronaldo scored with a penalty, Bernardo Silva, Andre Silva and Nani were also amongst the scorers. Chile have been playing good football in this tournament and have booked their place in the semi-finals but now they have to face the European Champions. Alexis Sanchez just became their all-time top scorer after scoring in their game against Germany which ended in a draw. They played against Australia in their previous game and was able to manage a draw after Troisi scored first for the Aussies in the 42nd minute. Martin Rodriguez equalized for Chile in the 67th minute. Being a semi-final with quality teams, anything can happen here. When these sides last met it ended in a 1-1 draw way back in 2011. So who do you think got better chances in the match of Portugal vs Chile. The Portugal vs Chile Live streaming would be available on Fox Sports across the United states.